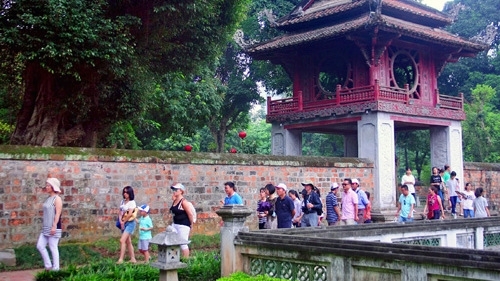 Hanoi’s municipal Department of Culture, Sports and Tourism will develop a master plan for the preservation and promotion of the value of Van Mieu–Quoc Tu Giam (The Temple of Literature). Van Mieu – Quoc Tu Giam receives nearly 1.5 million domestic and foreign visitors per year. Under the plan, the department will study and propose measures to develop cultural and tourism products as well as diversify services for tourists visiting Van Mieu – Quoc Tu Giam. In addition, the authorities will form plans for visiting routes, information systems for visitors, car parks as well as focus on improving the quality of management of the relic site, particularly in regards to measures controlling environmental pollution. Notably, the plan will include solutions to preserve and repair ancient monuments, landscapes and architecture as well as enhance the organisation of cultural and educational activities to attract more tourists. The plan will also set out measures to enhance communication to raise public awareness of preserving and promoting the relic site. The project is expected to be implemented in 2017 with support from the co-operation project for the development of Hanoi’s urban area between the city and the Île de France region of France. Van Mieu – Quoc Tu Giam, which has a total area of around 54,331 square metres, receives nearly 1.5 million domestic and foreign visitors per year. The relic has become a familiar place for numerous national and international cultural and educational events.